In Slovak a swallow is called "lastovička"
When people were living in caves, so did swallows. 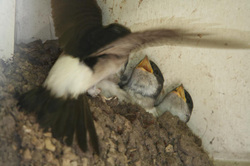 Since people live in houses, swallows find places in buildings to make their nest. They prefer to built their nest on the countryside in buildings with animals. At holiday house Swallow you see a lot of swallows. Once a swallow even built a nest in the bathroom! According to popular belief a swallow brings good luck. Where a swallow builds its nest, prosperity will prevail and the lightning will not strike.